It is the Birthday of my country, 4th of July. This is written mostly for other Americans, though it could apply to others in countries that have similar freedoms. I am thankful for my country. I am thankful to be born an American. My mother is an immigrant from Japan by marriage, so I am a Japanese American. She was alive during World War II. She has memories of the sky being full of parachuting soldiers flying down, and what an amazing sight that was to her as a child. And she has said many times how thankful she is that Japan did not win, because they would have been far more brutal than America was to Japan after the war. In her experience, the American Government that came over after the war were gracious and helpful. Though I am not saying America is perfect by any means, many of us who were born in America don’t know how good we have it compared to many other places in the world. I am saddened by Americans who bash America. The saddest part is that these people are destroying their own home by bashing it. Once they destroy their home, where will they live? But I understand why may want to. Horrible things have happened on this land. Horrible things still happen on this land. But the problem is not a country problem. The problem is a cruelty problem. The United States of America is not perfect, I know that. There are things that happened in America’s history that anger me terribly, that horrify me, that I still need to seek healing about. But NO country, NO nation is perfect. Cruelty exists worldwide. In the midst of being in an imperfect country, what can I be thankful for? Some countries do not have religious freedom and will kill those who do not comply. Some countries do not allow homosexuality and the penalty is death. Some countries legally allow the selling of wives and children into human trafficking. Some countries legally allow the killing of wives and daughters for discipline. Some countries do not have freedom of speech and the penalty is death. There are many more things I could be thankful for. 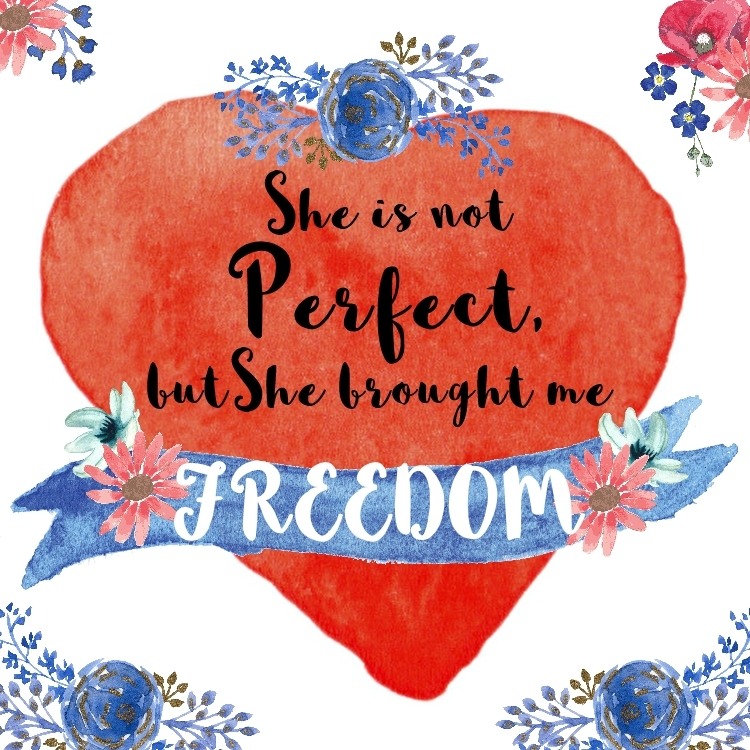 Though my country is not perfect, I am THANKFUL that my country has freedom! Many people seem to not remember their history of what it took to achieve this freedom in the world. Good people had to fight for freedom. Good people died for freedom. Courageous and caring people risked their lives to smuggle slaves. Brave and loving people stood with those who were segregated, facing arrest and harm. May I never forget these brave and courageous people. If you find that you are too angry or traumatized by the horrible things that have happened in this country to be thankful, please read the end of this post and at least receive my prayer for healing for you. I want to see America become a better place. But bashing it is not the answer. 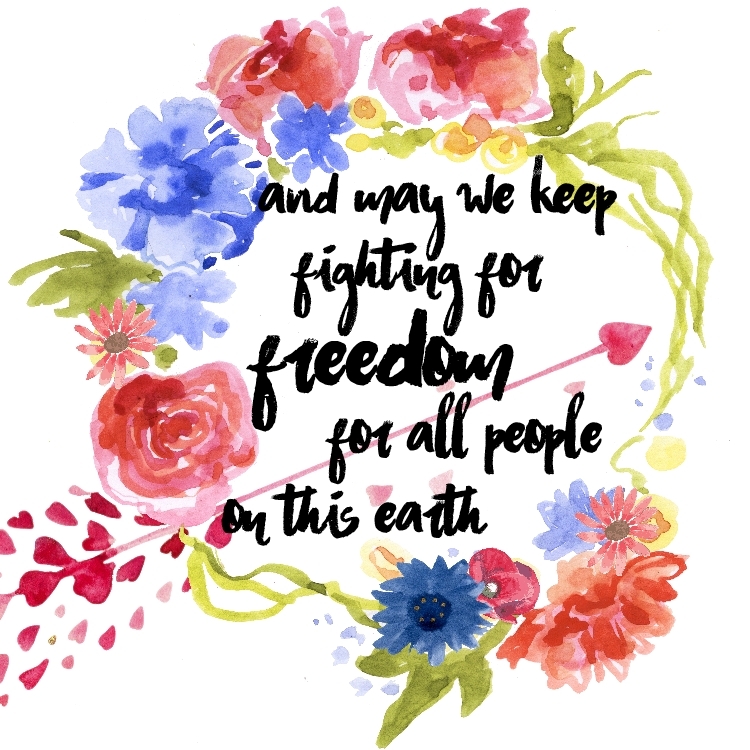 What can we do to make America and the world better? If every American adult picked the ONE cause they are most passionate about, and donated money – even just $10 a month to it, or volunteered time – even just 5 hours a month, can you imagine the difference it could make? Be thankful for everything good that we have. Be the best that we can be with what we have available to us. Take advantage of all the opportunities that we do have available to us. Follow our dreams, go for our goals, fulfill our purpose and calling on this earth. Do what we can to make our own sphere better. Then expand our sphere to spread goodness to a bigger sphere. Apologize to the universe for all the wrongs that our country has done, on behalf of our country, and ask for healing for our land. If you are super angry or feel violent about some of this, seek healing. You are not alone. Healing is available. KNOW that there are many good people in the world who are against cruelty and who are freedom fighters. KNOW that we can join our prayers, our intentions, our dollars, and our efforts to make a difference in the world. May our country become a better place. May the suffering of people become less each day, less each month. May people be raised up who can provide help to the suffering. May good leaders be raised up who will bring an end to cruelty and bring provision to the suffering. May cruel people have a radical change of heart, and become crusaders for good. 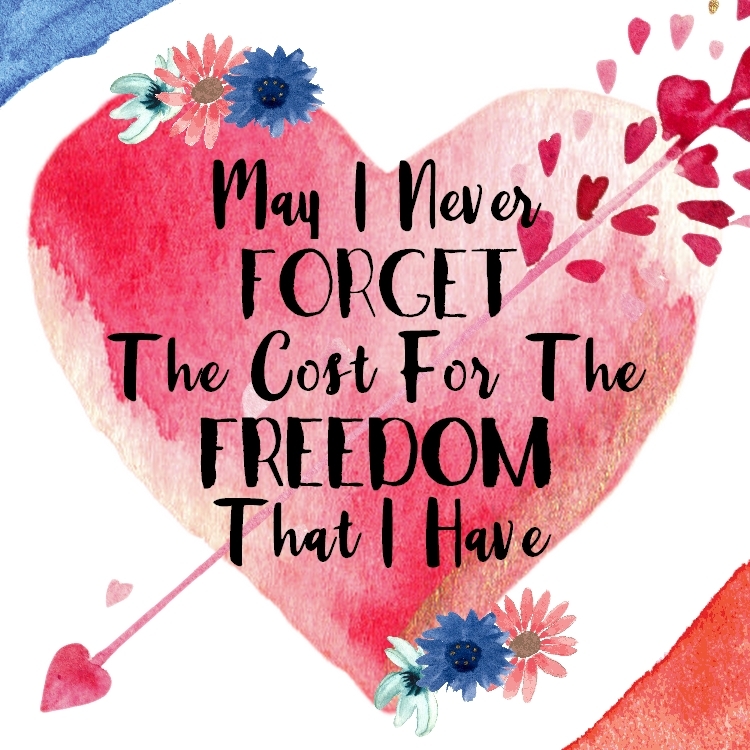 May those of us who have freedom be thankful and practice gratitude for it. 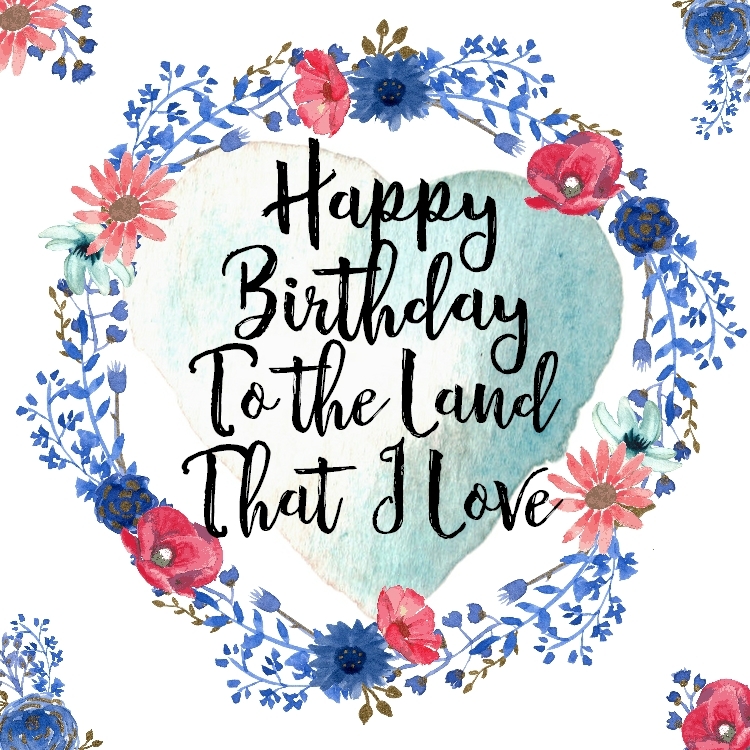 If you are having a hard time being thankful for your country, may you receive healing for all the trauma from cruelties that break your heart. May you receive peace that washes away all the pain and anger, may you receive peace that justice will be worked out in space and time. May we all apologize to God and the universe on behalf of our countries, and may our lands be healed. 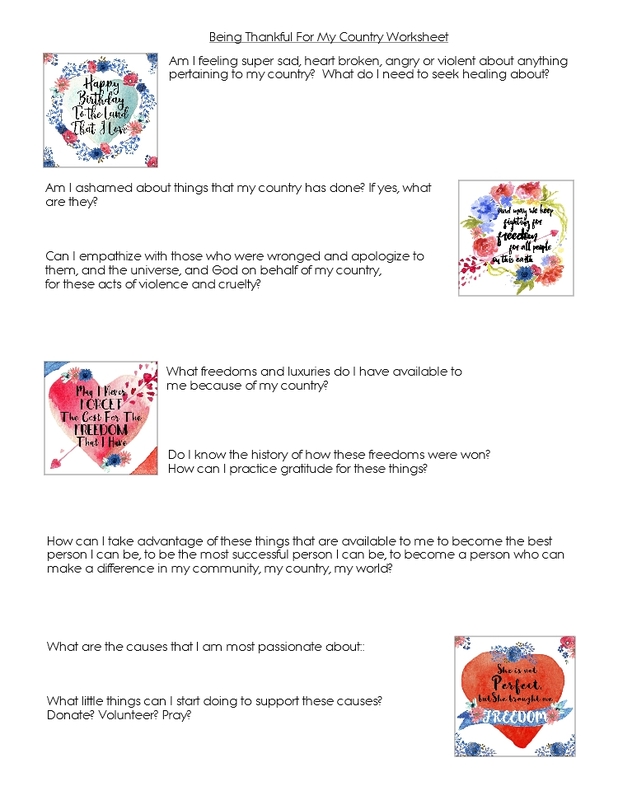 Click HERE to download this worksheet I have created to help process some of the things I have written about above, to help you make peace with your country, and to make movement toward being grateful and making a positive difference in the world! p.s. Some of this was hard to for me to write. Although I say be thankful, and I really am thankful, I will admit it is hard at times. I do not come from a privileged financial position. 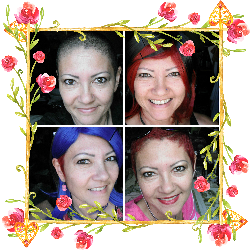 I am dealing with financial and health problems (aside from the breast cancer). But I am so thankful that I am poor and ill in my country. We have been on financial aid, and medical aid, and so thankful to have it available. But I am also determined to not stay in this place of lack. And being grateful is a beginning. So if you feel it is hard to be thankful, join me and do your best to be thankful anyway! Be determined to break out of the pit we are in! Join me! We can do this! Grab a hold of a good future! Because we have work to do! And huge blessings to you.